Stems: erect, simple or branched, glabrous. Leaves: alternate, lanceolate, entire, pale beneath, acute at the apex, narrowed at the base, thin. Flowers: magenta, in terminal spike-like racemes; petals four, entire, spreading. The tall strong stems of this striking plant rise to an average height of three feet, though frequently taller, and terminate in long racemes of bright purplish flowers, in which the number four is conspicuous, each one having a very long calyx-tube divided into four segments and four large, rounded, wide-open petals. The four-cleft stigma at the apex of the long style is extremely prominent. The mid-ribs of the leaves, the stems, the buds, and the calyx-tubes are all a dull red; and when the seed ripens the long narrow vessels burst open lengthwise and send afloat in the air clouds of white silky tufts, to each of which is attached a seed that ultimately falls to earth seeking some new spot favourable to its development. The name Epilobium signifies "upon a pod," and probably refers to the fact that the flowers grow on the ends of the long pods. Willow-herb refers to the fact that the leaves resemble those of the Willow. Wild Fire, or Fire Weed, is another common name for this plant, and a very appropriate one, too, for it is marvellous how quickly these stately, handsome flowers will cover over and beautify those tracts of country that have been charred and desolated by forest fires. Of fire-swept land Is with a blessed meaning fraught, And we - when pain hath fully wrought - Shall understand." Epilobium latifolium, or Water Willow-herb, is a very handsome species which grows in wet places and marshes, or near water. It may always be recognized by its large bright magenta flowers and the glaucous appearance of the stems and leaves, - that is to say, by the whitish bloom which covers them. The leaves are also thick and very soft, entire, sessile and narrow. Epilobium anagallidifolium, or Mountain Willow-herb, is a tiny dwarf plant, from two to six inches high, growing on lofty summits. It has small magenta or sometimes white flowers, which nod at the top of the slender single stems, up which a few pairs of little oblong leaves grow. It has been found at the immense altitude of 10,000 feet. 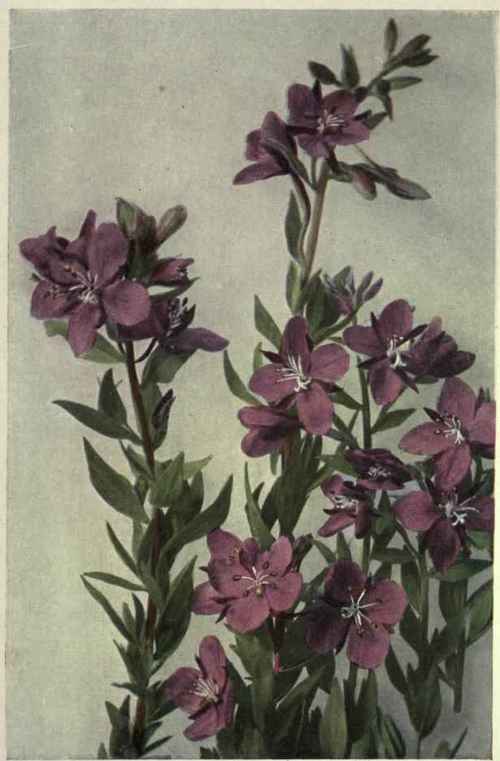 Epilobium Hornemanni, or Hornemann's Willow-herb, is a common species which grows about eight inches high, bears small purplish-pink or white flowers that are strongly veined, and has very long slender capsules, or seed vessels, on its reddish stalks. The pretty little blossoms are surrounded by a green calyx and surmount the narrow capsules, which are usually from an inch to two inches long. The leaves are short-stalked, ovate, blunt at the apex, narrowed at the base, and nearly even-margined. Epilobium paniculatum, or Panicled Willow-herb, has stems loosely forked in pairs, and the leaves are chiefly alternate, narrow, clustered in the axils, sparingly toothed, pointed and tapering into a slender winged stalk. They are frequently folded along the midrib. The mauve flowers are scattered towards the ends of the erect stems. Epilobium clavatum, or Few-flowered Willow-herb, is taller than the preceding species, and the leaves are broadly ovate, very blunt at the apex and rounded at the base. The rose-coloured flowers grow nearly erect and the capsules are an inch long. Epilobium adenocaiilon, or Northern Willow-herb, is much branched and bushy and has lance-shaped, sparingly toothed, leaves, both the stems and leaves frequently being purplish. The somewhat nodding pinkish flowers are numerous and grow in the axils of the leaves.